The skies around Haydock Park on Merseyside were quite a sight during the 26th and 27th of June, as the Vertikal Days lifting and access event came to town. The show - organised by industry magazine, Vertikal - is the UK and Ireland's fasting growing event of its kind. In Europe, only Bauma beats it for size. 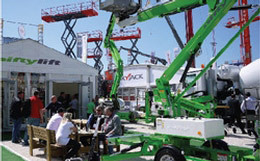 Suppliers at the event included Multitel, Niftylift and Skyjack, and many companies launched new products at the show. As well as the huge display of lifting and access equipment on display, Vertikal Days also acted as a two day networking event, with association and company meetings, seminars and workshops all being held over the two days. These included a meeting held by the Strategic Forum Plant Safety Group, organised by the Construction Plant Association, where competence for plant operators, guidance on maintaining telehandlers and assessing ground conditions were among the topics discussed. Pasma and its members also delivered a number of short seminars at the event's ‘marketplace' area, and held their AGM at the event, while representatives from the HSE were on hand to discuss the recent review of the Working at Height Regulations, and the simplified guidance that is now available on the topic. To view our album of pictures from the event, please click here.